You really like your home, you really like lying on your couch, watching your favorite TV show, reading a good novel. You do try to have the best comfort on a good couch, a nice warm duvet cover and yet, something is still missing. You either get too hot during the summer, or you get quite cold during the winter. You have not given it a thought until now, but do you know that it might be your curtains (or the lack thereof) that are not good enough for your room? The best energy efficient curtains are able to work miracles for your comfort every day. It has been known that the best insulated curtains will keep warm air from leaving or entering, thus maintaining a constant temperature. Another blessing from the best energy saving curtains is that they will soundproof your room; so, you will not bother your neighbors with your noise, but neither will they. Party all you can! The best insulated curtains will have an outer decorative layer supported by a high density foam layer that blocks heat exchange and also sound waves. These energy saving curtains create a vapor barrier to block moisture and, in the cold season, direct heat back into the room. The numerous options for the best energy efficient curtains will surprise you with the many shapes, forms and patterns and, for sure, will solve many problems when it comes to comfort in your living room. At the drop of the hat, here are 10 of the best energy saving curtains; price and quality, they will mean a world of difference to your home and will make you regret that you haven’t found them earlier. So one could say that a low price means low quality for your insulated curtains, but the Deconovo Room Darkening Thermal Insulated Blackout Grommet Window Curtain Panel for Living Room sure make a nice surprise on many. You do get one panel per package, but the curtain does a great job when it comes to making you feel more comfortably in your room. The curtain panel blocks out most of the sunlight, no matter the season or the time of the day. It’s also pretty efficient when it comes to lowering the outside noise, creating a nice, quiet feel in your room. Each panel comes with 6 silver color grommets that slide nice and easy. The fabric is 100% polyester and the curtain doesn’t attract any type of dust or mites, becoming a sure choice for the allergic customer as well. You may find the perfect size and design for your curtains as it comes in various lengths and designs. The curtain feels soft to touch and doesn’t wrinkle. It looks great on any window and runs true to size. Additionally, it’s easy to maintain and clean. To sum it all up, as it blocks some light and noise from the outside, the panel curtain is quite a bang for your buck. Easy to hang and well able to keep the sunlight at bay, the Amazlinen Sleep Well Blackout Curtains Toxic Free Energy Smart Thermal Insulated make it as a fair choice when you go shopping with only few bucks. The curtain is sold as a single panel and features 8 antique bronze metal eyelets that give an elegance vibe to any window. The blocking abilities of the curtains are quite good as it manages to keep almost 90% of lights and 100% from the UV from entering your room. It’s also able to minimize the outside noise, giving you a nice environment for a deep sleep. The fabric of the fabric is made with triple weave technology, which explains its ability to block the light and the noise. The curtain has an Eco-friendly finish and has no chemical coating, nor toxic smell. You can save some energy when using the curtain as it lowers the risk for heat loss in the winter, but keeps you cooled in the hot summer. It’s easy to take care of the curtain those only needs some machine-wash in cold water from time to time. You don’t need to use a bleach and you should only tumble-dry low. The curtain doesn’t wrinkle and hangs well. You may warm iron it for the perfect look, though. The curtain has a good length and just the right weight. It’s easy to hang and comes for a great price. It has a nice color and the fabric is fade-resistant, protecting your furniture and rugs from the harmful UV. The minor issues aren’t deal breakers for us and the curtain still stands as a pretty good option to keep the sunlight from entering from your bedroom, especially if you don’t want to spend the extra buck. 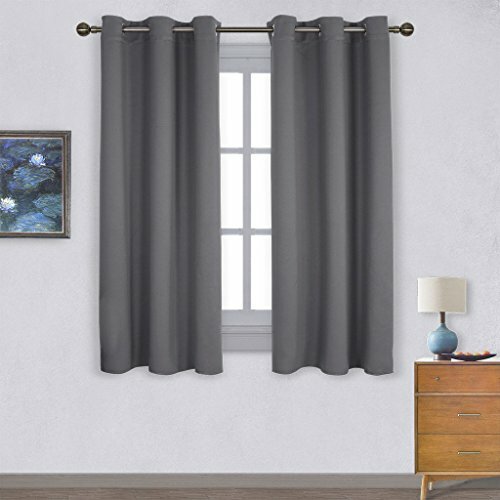 Nicely colored and well made, the Nicetown Thermal Insulated Grommet Blackout Curtains for Bedroom are a dependable option for the fixed budget. 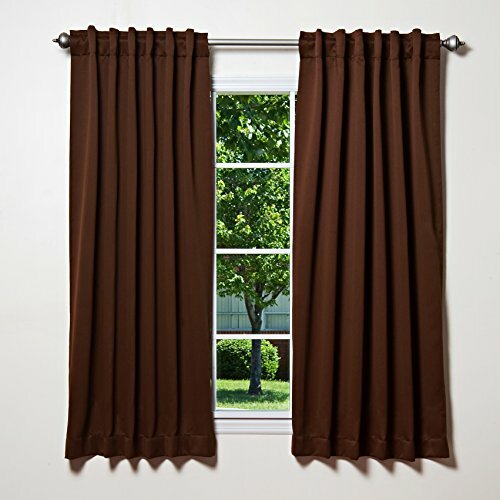 The curtains are made with polyester and you actually get a set of 2 blackout curtain panels. Each of the panels come with 6 grommets top and they glide smooth and easy every nice. We like the curtains as they keep 85-99% of the light from entering your room but keep at distance the UV rays as well. They are efficient when it comes to lowering the noise from outside and let you watch better your TV shows. Keeping the light from entering, the curtains also protect your furniture, floors and artwork. The fabric on the panels is triple weave blackout so it balances efficiently your room temperature. They are interwoven by top layer, high-density black yarn and back fabric layer with high triple weave technology. This means they cool your room in the summer and create a nice heat during wintertime. The blackout curtains are well made and the thread is trimmed, winkle free, whereas the nice seam increase the impressive finish look. The curtains are thick and have a smooth feeling. They just the right weight and flow nicely, fitting in any room. We really like the panels as they run true to color and are so easy to open/close. They are also easy to maintain and you should only use some cold water when machine-wash them. You may tumble dry and use some quick ironing or steam clean when in need. All in all, the curtains are pretty efficient when it comes to keeping the light and noise away from your room and look so nice as well. If your room has big large windows and you want to block out some of the light and the noise that comes from the outside, you can give it a go with the Utopia Bedding Thermal Insulated Blackout Curtains. The curtains come in 2 panels and cover a pretty large area. Each of the panels come with loop and rod pocket style as well, so you get to enjoy the versatility of the curtains. The loops nice and elegant and are very wide. 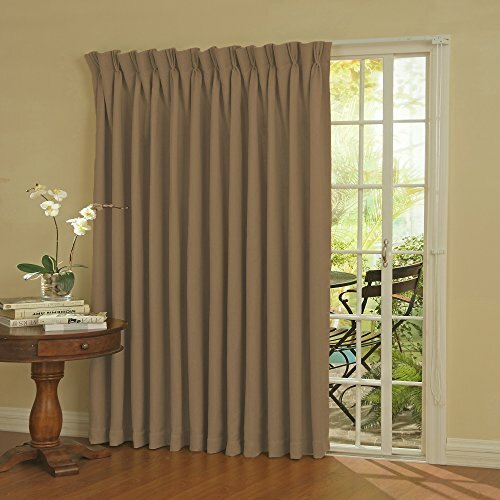 The grommet top curtains have a 1.6 inch inner diameter that fits and slides smoothly on most standard curtain rods. The material is the same on the front and back and it feels quite nice and soft. 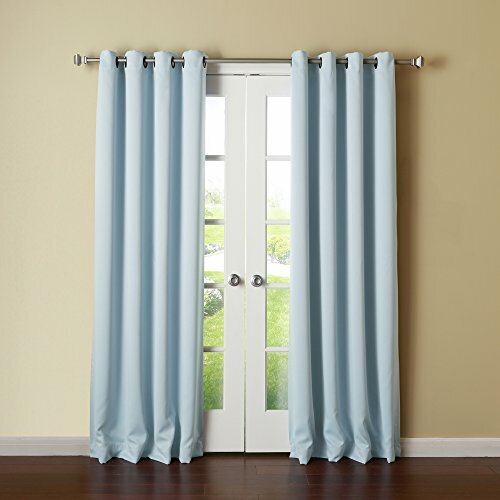 The 4inches wide hem and 1inch side hem give the curtains a rather elegant appearance. As for the insulating abilities, the curtains are made with thermal top that is energy efficient, blocking almost 99% of light and filtering 60% of the outside noise. The curtains keep the UV-rays from passing through and block any type of temperature, giving you a nice cooling atmosphere in the hot summer, but trapping heat inside during the coldest winter. The polyester fabric of the curtains is long lasting and hangs very well. They manage to give value to any corner and make a nice option for the long windows. The curtains are easy to take care of and you simply machine wash them on cold, tumbling dry on low. You may also gently warm iron them afterwards. Thick and running true to size, the curtains are easy to work with and slide easily across the rod. Despite the cons, for the money you pay, the curtains do stand as a reliable option for the large, long windows. The Best Dreamcity Room Darkening Thermal Insulated Solid Grommet Linen Look Blackout Curtains for Bedroom stand out from the crowd with their fabric that manages to be efficient, even though it’s not as thick as you may expect for some insulated curtains to be. 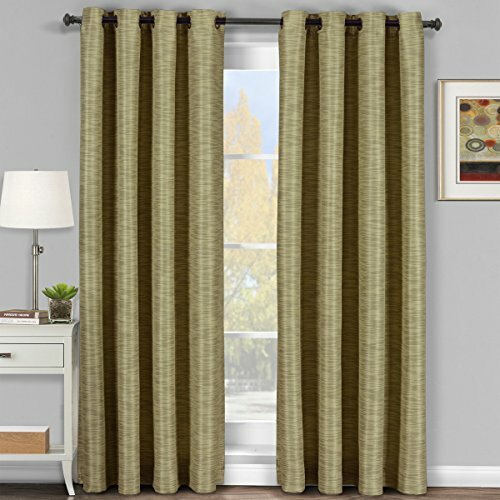 You get two panels in the set and the curtains manage to keep at distance almost 90% of the sunlight (if they are light color) and 98% when they come in a dark color. The curtains are also thermally insulated which means they keep the room cool in the hot summer and create a nice warmth, during the cold winter. They also reduce outside noise, creating a nice sleep environment. The fabric is high end faux linen that hangs well and has a nice texture. It’s thin and is loosely weaved, leaving a flowing vibe in the room. The fabric is thread trimmed and wrinkle free, presenting a nice finish. The silver grommets are evenly places and tightly secured to the fabric. It’s easy to open/close the curtains that glide pretty smooth. The curtains are well made and very easy to hang. They protect your furniture and rugs from fading and don’t need ironing. Nevertheless, for the price you pay, the curtains are an interesting, nice looking and efficient choice. There are plenty of good insulated curtains out there, but what makes the Best Home Fashion Thermal Insulated Blackout Curtains a dependable option when in need is their ability to really block out sunlight and dangerous UV rays. The curtains are made with a triple weave fabric that doesn’t let any of the sunlight or the UV rays get through, inside your room. Therefore, the curtains insulated pretty well against the heat and cold, which has a great influence on your budget. As a matter of fact, the fabric is laboratory-tested for its ability to insulate against the cold. You don’t need to worry much about the noise either as the curtains do lower the noise from the outdoor getting inside, helping you had better sleep. The versatility of the curtains is also something to talk about as the curtains present back tab and rocket pocket hanging styles, which gives you nice options for styling. The curtains are made with 100% polyester and are easy to care for as they’re machine washable, with warm water with like colors. You may use some non-chlorine bleach if needed. You should only tumble dry low and warm iron for better appearance. Nice, soft against the skin and so pretty colored, the curtains are both efficient and nice looking. In spite of the minor issues, we still like the curtains for the nice colors and ability to block the sunlight or the harmful UV-rays. 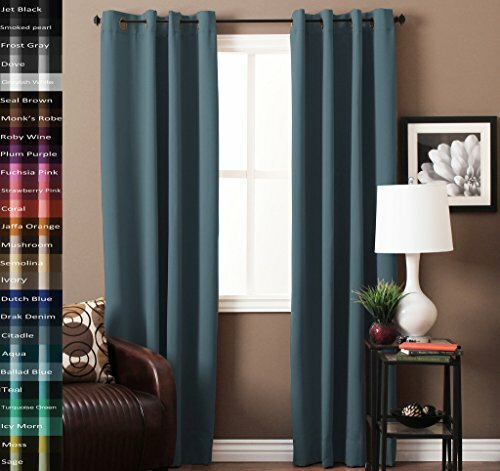 It’s impossible not to find the best color for your bedroom curtains since the TURQUOIZE Solid Blackout Drapes come in an impressive diversity of colors. The curtains are made with 3 pass polyester blackout fabric so create a private room from the second you hanged them. They keep outside noise away from your bedroom and insulate well against hot. They also block out 99% of light, creating a darker room on a sunny day. The curtains save your money, energy, and come as two panels. They feature antique bronze grommet tops and add al elegance appearance to any room. The fabric feels soft and has a nice touch feel as it’s made with special polyester yarn. The fabric is lightweight and hangs very nice. It’s thick, but feels nice against the skin. The curtains are easy to open/close and look very well made. It’s easy to take care of them as you may machine wash them in cold water or dry clean when in need. You should only use low temperature for drying and ironing and never use bleach. Summing it all up gives us the image of some insulated curtains that look nice and come in so many fun colors. Heavy and nice looking, the Best Home Fashion Thermal Insulated Blackout Curtains not only block out the sunlight for you, but also insulate your room efficiently, saving you some money and energy. The curtains are made with triple weave fabric so they don’t allow sunlight and UV rays get inside your room. They also insulate against the heat and cold, trapping the warmth inside on a cold winter and cooling it in the summertime. The fabric is actually laboratory tested when it comes to its ability the insulate against the cold. It’s heavy and hangs very well. It has a silky feel to it and has a nice flow. We like the curtains also because they minimize outside noise, helping you fall asleep faster, for all night long. The two panels feature antique bronze grommets (8 on each panel), giving an elegant, modern feel to any room. Taking care of the curtains isn’t difficult and you may easily machine wash them with some warm water, with like colors. You should only use non-chlorine bleach when in need, tumble dry low and warm iron for the perfect look. 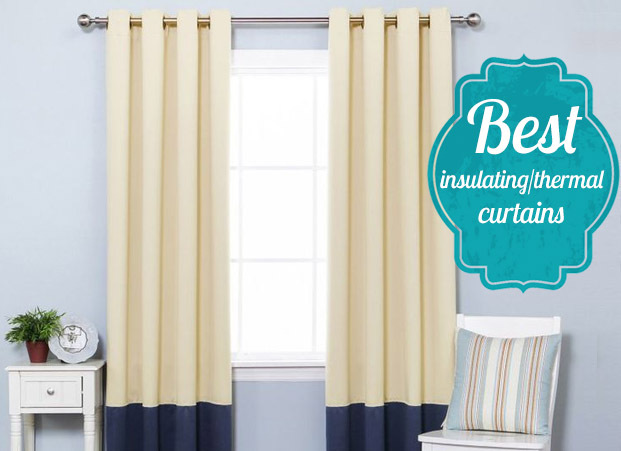 Measure your windows so that the curtains have a nice full appearance on your windows. All things considered, for the good quality, modern appearance and ability to block sunlight and insulate against the cold, the curtains may be the key for a better sleep. For the big nice home that comes with a patio door, an efficient option to keep most of the sunlight and outside noise from entering your room is the Eclipse Thermal Blackout Patio Door Curtain Panel. The curtain is made in the USA or imported and makes is as stylish alternative to some vertical blinds. The fabric on the curtain is made with thermal weave technology so it manages to be thick and able to insulate your room. The blackout curtains offer you nice privacy, minimizing the outside noise and saving you energy. It traps the warmth inside the room in the winter and creates a cooling environment in the hot summer. The curtain is very wide and is seamless, which gives an elegant and classy feeling to your room. It comes with multiple easy-to-hand options so it’s versatile and easy to use in various situations. You may hang it on a decorative rod with the clip rings/back tabs, or you may also hang it on a traverse rod with the drapery hooks. Either way, the curtain looks nice, glides smoothly and is efficient. The instructions that come along and easy to understand and to follow. 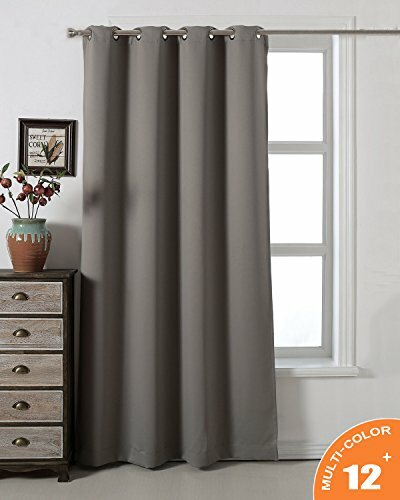 The curtain comes in nice, elegant color options and is easy to maintain. You may iron with a damp towel on the front side of the fabric for removing the wrinkles. You shouldn’t bleach it. The soft, silky touch feel of the curtain is an important detail and doesn’t match the heavyweight of the curtain. Despite the minor downsides, the curtain is efficient especially if you got tired of all that noise and sunlight from your patio. 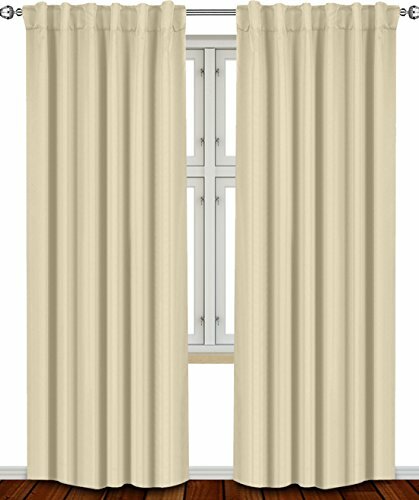 Put your trust and faith in us when we recommend you the Pair of Two Top Grommet Blackout Thermal Insulated Curtain Panels. 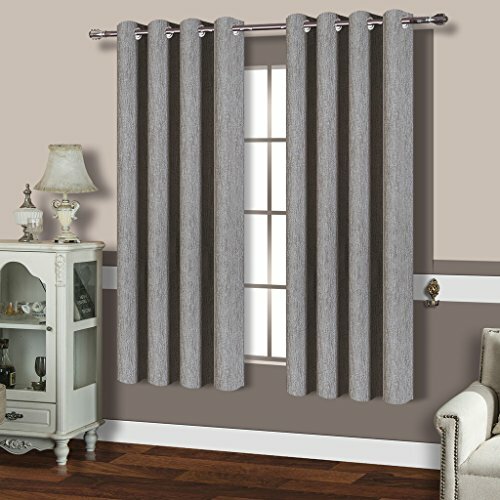 The curtains impress with their craftsmanship that is high quality, leaving you with some long lasting and nice looking curtains for your room. The fabric on the curtain is laboratory tested and keeps more than 99% of the sunlight from entering your room. It’s also efficient when it comes to lowering the outside noise, creating a nice, quiet atmosphere for your sleep, no matter the time of the day or the season as well. The blackout technology on the curtains blocks the light and protects your furniture and rugs from fading. The Triple-Pass thermal coating back layer increases the ability of the curtain to create a darker room, quitter room. 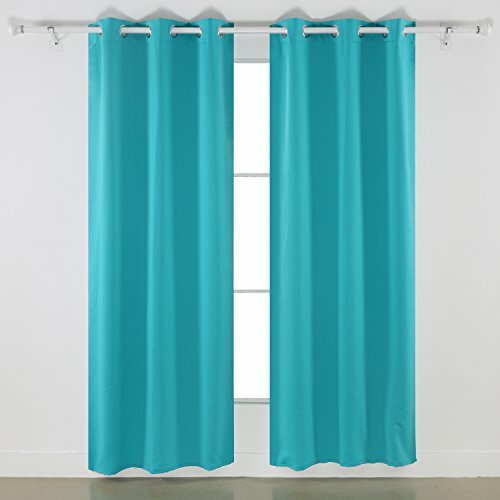 The curtains come in pair, in nice, elegant colors. They do have a modern feel and give your bedroom a contemporary look. The silver metal grommets are sewn at the top and are an elegant detail. They are nicely spaces to that the curtains give pleasant gatherings when left open. The curtains are made with 100% and are also machine washable. They run true to colors and have a slight shimmer. Heavyweight, without being bulky, the curtains hang well and have a nice flow. Our takeaways are, that the curtains make a nice investment for anyone looking to give an elegant finish to their room, without losing on their privacy as well.